Today in Australia is Australia Day. The day were everyone within it's hot toasty boarders, regardless of whether you were born here or have added to it's cultural mix, celebrate the fact together we are Australia and everything positive this nation plentifully has to offer. 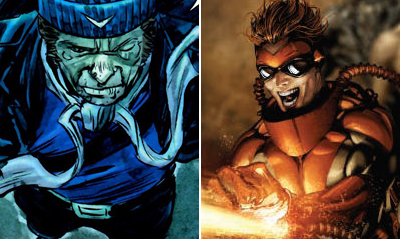 One thing Aussies haven't had in plentiful numbers, are mainstream comic characters. Getting 'a fair crack of the whip' has never really happened in the pages of the Big Two for any decent 'bloke' or 'sheila'. On the rare occasion it does, they always wear a get up that's covered with boomerangs, because that's how people dress down under - at least in the Australian half of down under anyway - right? Still before I 'chuck a wobbly', it's time to 'take a gander' at those who prove regardless of how few Aussies see print and what kind of 'argy bargy' they get up to, we always know 'she'll be right'. 6) BOOMERANG One of the best merc's of 80's Marvel, I loved Boomerang working for Justin Hammer, especially when he fought Tony Stark. A guy with trick boomerangs vs Iron Man? 'Strewth'! 5) DREAMGUARD The best written 'Ocker' in comic history is also one of the least known. Willie Walkaway left the teachings of his grandfather to become a cop in Kagoona Crossing. Years on, as the alien citadel Orphan starts unleashing the terrors of a man who stumbles into the outback's Dreaming Country, Willie ditches his 'strides' and takes up the mantle of the Dreamguard to set things right. 4) CAPTAIN BOOMERANG: Like Marvel's Boomerang George "Digger" Harkness was always a bit of a 'yobbo' when it came to fighting a guy who moves at the speed of light, but George took on a deadlier slant in the pages of Suicide Squad. Now back from the dead, hard-edged Harkness isn't quite as famous as 'Acca Dacca' or 'The Crocodile Hunter' - but in comic terms he's pretty close to it. 3 GRIZZLY (top of the post): Grizzly was a redhead (like me), from 'down under' (like me - ok I'm originally a Kiwi but that's down under too!) 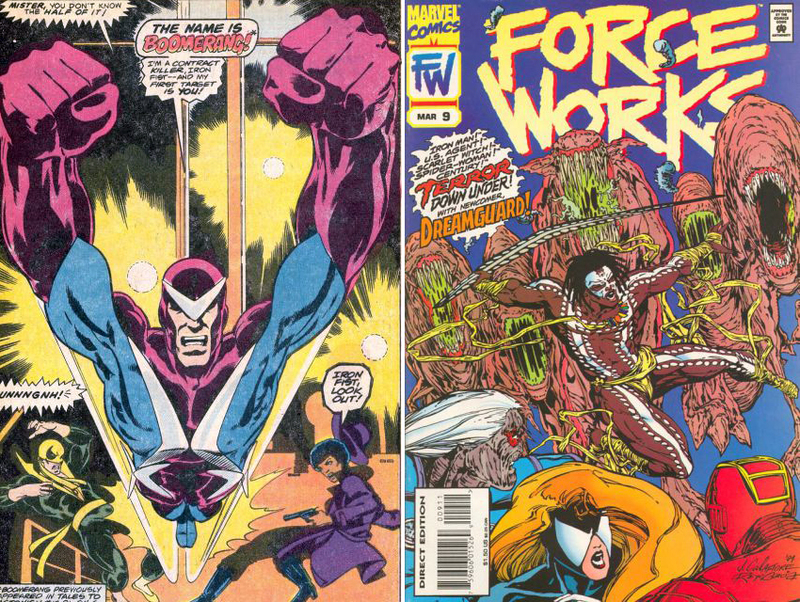 and had a warped sense of humour (again like me), so when Marvel made the musclebound strongman (not so much like me) Domino's verbal jabbing, right hook hitting back-up in the Six Pack, how could I not like him - we're almost twins! 2) PYRO: 'Cheers' to the guy who has been the drop-in character for X-books in need of a decent henchman for decades. A pyrokinetic from Sydney and member of The Brotherhood of Evil Mutants, St. John Allerdyce can manipulate existing flame any way he choses. Heck, it even got him a key role in the original X-Men films! ''Flamin' heck'! No, not the DC one Prometheus turned into a floor rug 'ya larrakin' - this Taz has been Australia's foremost fictional character and deservedly so for years. 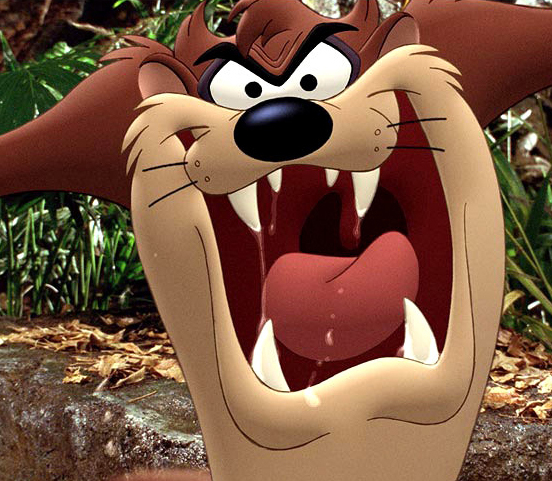 Appearing in DC's Looney Tunes comics (and millions of other places) Taz has whirled through the laughs and food faster than audiences can digest. Think that's not 'Aussie'? Try throwing a few prawns on the barbie, and you'll see I'm only 'too right'! Aw, no Shimmer and Mammoth, yeah - I know they're villains, so probably not the best choices. Happy Australia Day! 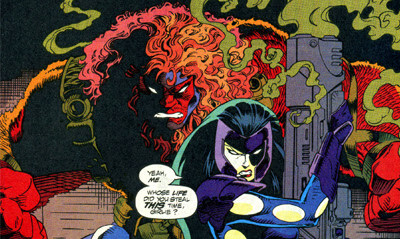 I'm liking Marvel's Boomerang in Thunderbolts. The way he acts with those other "thougher" characters, and his part on the victorian era. About Georgie, You know he is in my heart! Anyway, if ther is something Australian autors have is imagination mixed with feeling. Things I get to see are always emotional and I like it. Loved your post. Have a great day. I'm glad Boomerangs in the Bolts too Aliera! Sometimes you fear the smaller villains are going to get lost, but he really has found a good home there. Hey Dave, yip Marvel's Boomerang was born in Alice Springs, which isn't that far from where I am now.